Our conversation focuses on Courtney’s work trying to impact the “school to prison pipeline,” which according to the ACLU is a nationwide system of education and public safety policies that pushes students out of school and into the criminal justice system. These education policies are disproportionately targeting youth of color and youth with disabilities, and today we talk about not only why that is, but what we can do about it. I believe this one of the most important social justice issues of our time, and it’s one that absolutely has an impact on the lives of thousands of differently-wired children everywhere. I hope you enjoy the episode and that it motivates you as much as it did me! About Courtney: Courtney is a domestic violence survivor whose multi-racial family struggled for respect amid issues like substance abuse, incarceration, high-school dropout and teen pregnancy. As a young adult, her mission became to create a world where “respect for all” is the status quo. A nationally recognized youth development expert and award-winning journalist, Courtney is co-author of the best-selling book, RESPECT, and led the creation of groundbreaking self-respect building tools, such as The Respect Basics. Courtney has been featured by CNN, ABC, National Public Radio, USA Today, and Teen Vogue, and was tapped as a resource by the White House and the Global Clinton Initiative. She was a top-five national finalist for the American Express NGen Leadership Award, was most named one of the ’42 leading women in education’ by the University of Southern California, and was a Local Hero Award Winner by Cosmopolitan for Latinas. In 2015, she was appointed to the Juvenile Justice Commission for Santa Clara County, California. Do you have an idea for an upcoming episode? We’d LOVE to hear from you. Please share your thoughts in our Suggestion Box! And if you have any other feedback or thoughts you’d like to share, feel free to leave a comment below or send us a note directly through our Connect form. If you liked this episode and know of others who would find value in the information, please use the social media share buttons below to help spread the word. Lastly, if you are so willing, I encourage you to leave an honest review for the TiLT Parenting Podcast over on iTunes. Reviews are very important for helping podcasts find their audiences, and we would love your support in helping us find ours! To subscribe to the podcast so you don’t miss a single episode, you can do so on iTunes here and SoundCloud here. I enjoyed the podcast, and was particularly moved by how the special education label often resulted in later life imprisonment, rather than advantages or modifications in programming that are often associated with that designation. Also, I became aware of how harmful “zero tolerance” can be and would opt for less stringent disciplinary procedures. As a former teacher and a mother of a differently wired son, it was a conflict,expecting conforming behavior, yet understanding that this was not always possible. Your options to change schools, classes and teachers shows that you are not satisfied with the “status quo” I think that the “Respect” approach is an attitude with specifics that might make the school venue more acceptable to more children and parents. 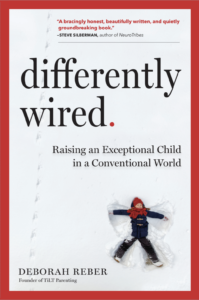 Get TiLT Parenting's short weekly newsletter with bonus content, tips, and a roundup of news relevant to parents raising differently wired kids. Awesome! So glad to have you with us! One last step -- check your email to confirm your subscription.